Being pregnant is a vulnerable time for a woman. But Imagine the thought of going into labor while incarcerated and the thought of handing your newborn over to the foster care system? Abigail Blue is the former executive director of The Birth Attendants: Prison Doula Project, which closed over 5 years ago, saw the plight of incarcerated pregnant women on a daily basis. 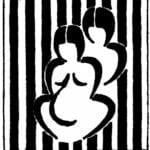 During Washington state’s last legislative session, Governor Inslee signed a bill allowing volunteer midwives and doulas to be able to give incarcerated women pre-birth counseling and help them prepare for the temporary loss of their child. The bill takes effect June 7th, 2018.